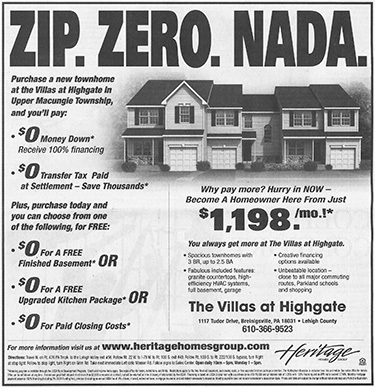 When you run an ad that references a down payment of any sort there are certain rules under regulation Z that require you to make certain disclosures. Here’s what regulation Z says about ads that disclose any amount of a down payment. You must provide the amount or percentage of the down payment – in this case we just say zero down payment is due at closing. Number of payments or period of repayment. If the ad you are placing is just a general ad, you can comply with these rules by using examples of typical transactions that are representative of terms received by a good percentage of your customers. (i) The amount or percentage of any down payment. (ii) The number of payments or period of repayment. (iii) The amount of any payment. (iv) The amount of any finance charge. (i) The amount or percentage of the down payment.